Back in the days of KryptonSite, Russ Dimino had a frequent column “The Many Faces Of…” where he’d look back at the different actors to play an iconic DC Comics role. He came out of “retirement” here to explore the different actors who have played The Flash, just in time for tonight’s premiere! This is an update of a column originally published in 2004. Anyone can tell you that Superman’s real name is Clark Kent, and everyone knows that Bruce Wayne is the man beneath Batman’s cowl. But ask a few comic book fans who the Flash’s secret identity is, and the answer is likely to vary. That’s because there have actually been several different characters to possess super speed, don an orange costume with a lightning bolt logo and take on the name of the Flash. 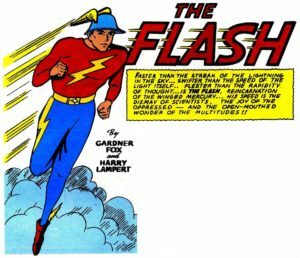 The original “Golden Age” Flash was named Jay Garrick, and first appeared in Flash Comics #1 in January 1940. His successor, Barry Allen, debuted in Showcase #4 in 1956. Barry’s nephew Wally West first appeared as Kid Flash, Barry’s sidekick, in Flash #110 in December 1959, and then became the full-fledged Flash himself after Barry died saving the world during the “Crisis on Infinite Earths” event in 1986. Bart Allen, Barry’s grandson, first appeared in Flash vol. 2 #91 and had a super-speeding career of his own under the name Impulse. Bart went on to become the new Kid Flash and served as a sidekick to Wally before inheriting the role of the Flash himself in 2006. A resurrection and a reboot have led to Barry Allen once again holding the title of the Flash in the comics in DC’s “New 52” era (a company-wide relaunch of all the titles saw much of the previous continuity wiped clean in 2011). 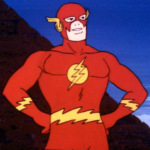 The first time the Flash appeared on television it was in cartoon form. 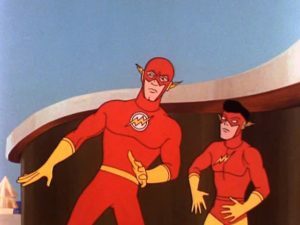 The scarlet speedster made several appearances on Filmation’s “The Superman/Aquaman Hour of Adventure” in 1967. Though the series primarily focused on the exploits of the two titular heroes, other heroes rotated in and out of an additional segment on the show. 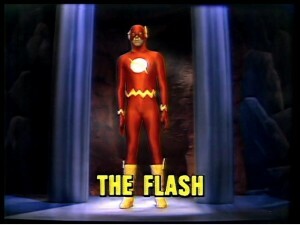 The Flash who appeared here was the Barry Allen version, and his voice was supplied by Cliff Owens. He was often accompanied by Kid Flash, a.k.a. Wally West, who was voiced by Tommy Cook. In 1979, the Flash appeared in a two part live-action TV special called “Legends of the Superheroes,” which featured characters like Batman and Robin, Green Lantern, Captain Marvel, Hawkman, Black Canary, and more. It was done in a campy, tongue-in-cheek style reminiscent of the Adam West “Batman” series of the 1960s, and, in fact, Adam West and Burt Ward reprised their roles as Batman and Robin. In part one, the heroes team up to save the world from a group of villains. In part two, the heroes pay tribute to Batman and Robin in the form of a roast. This movie has pretty much been relegated to the realm of bootleg copies sold at comic book conventions. The Flash was played by Rod Haase. Previous: Flash: Another “City Of Heroes” Clip – With Screencaps!